Do you want to learn how to put songs on iPod? Of course, the most common and well-known method is to use iTunes, but that doesn’t always work out the way you want it to! In other words, the iTunes software is very limiting when it comes to the kind of music that you can transfer between your device and your library. In some cases, it might even completely remove your precious songs altogether! Continue reading below to learn what we mean by that, and how you might be able to put songs from iPod to iTunes without actually using iTunes! Does not allow automatic transfer for non-iTunes store music. iPod to iTunes transfer is highly limited. Compatible formats include only MP3, MPEG-4, AIFF, WAV, AAC, and Apple Lossless . The first thing that you’ll have to do, is download and install the iTunes software. Once you’ve done that, you should be able to launch the program. It’s at this point that you should connect your device to your PC as well if you haven’t already. Next, make sure that you select the Music option under Settings on the left-hand side-bar. That will move you to the settings menu of your connected iPod device. Toggle on the “Sync Music” option. This will allow you to sync your iTunes library to your iPod library, transferring music you have on your iTunes onto your iPod! 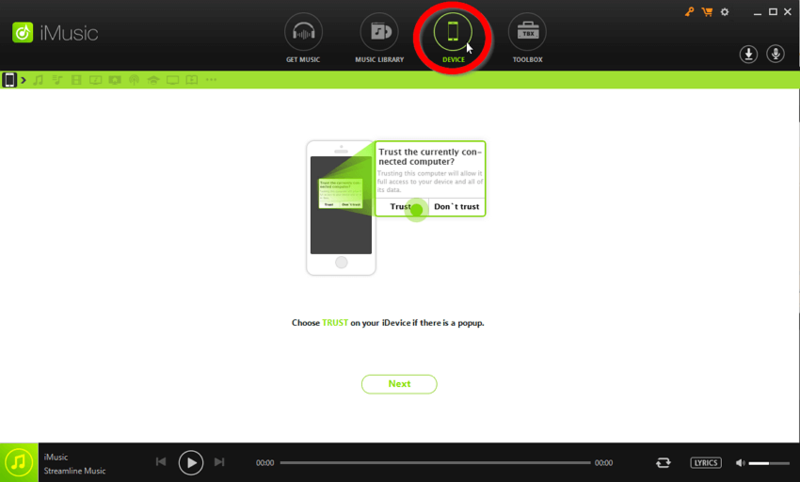 If you are able to toggle the “Sync Music” option on without receiving an error message, then you’re done! Simply click the Sync button on the bottom right-hand corner of the screen and wait for your iTunes to finish putting songs on your iPod! Select Settings > Summary and scroll down the summary settings until you reach the “Options” box. Under there, toggle on the “Manually manage music…” option. Make sure that you apply the options change by clicking the Apply button on the bottom right-hand corner of the screen. 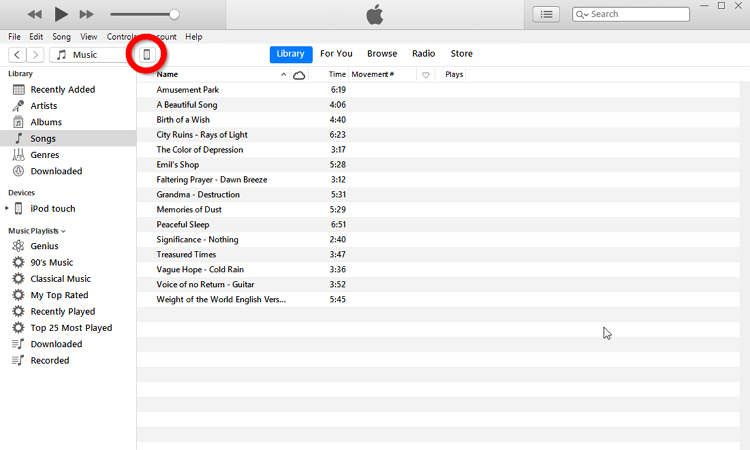 After turning on the “Manually manage music…” option, you can now drag items from your iTunes library and drop it onto your device (as is shown in the image below.) This way, you’ll be able to put songs on your iPod without iTunes deleting non-iTunes store music. Put music on ipod with itunes easily and safely. 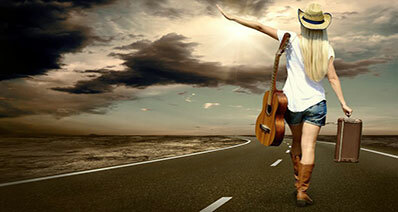 Complete iPod to iTunes library music transfer . iTunes library to iPod music transfer. Device to Device (e.g. iPod to iPhone) music transfer. Full Media back-up for safely storing your present data state. Convenient management tools: add, delete, move, etc. songs or playlist between your iPod and iTunes library. Of course, you’ll need to download and install iMusic before we can begin! You can do so from the iMusic official website. It’s best to connect your iPod prior to launching the program as well so that you can start immediately! 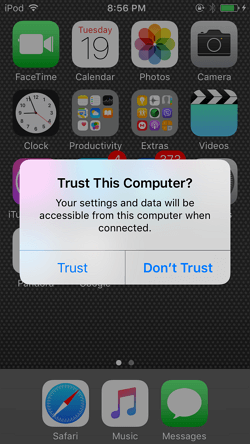 A screen prompting you to click Trust your computer will appear. 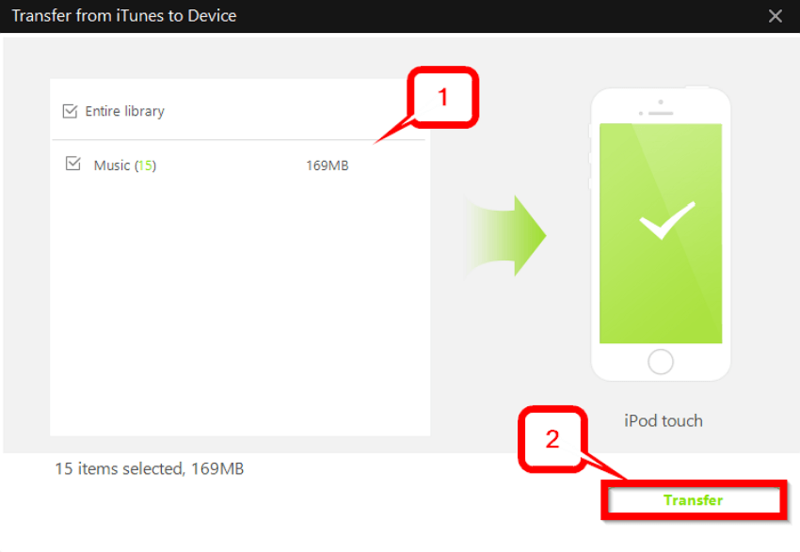 Do so in order to provide iMusic with access to the data on your device! The Device window should now have changed to show you your device and what you can do next. 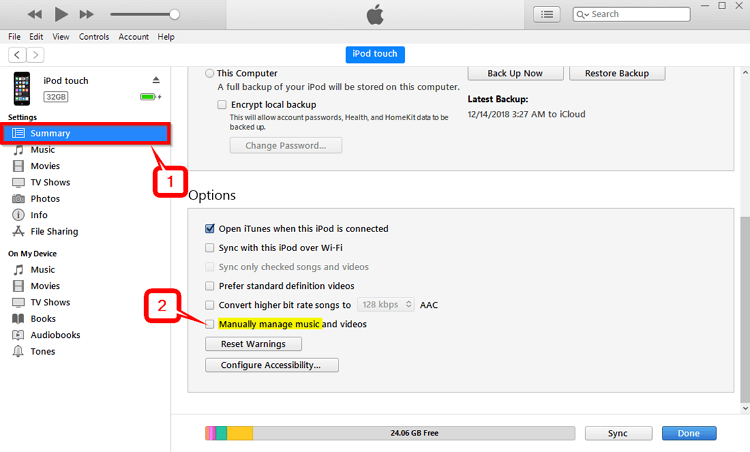 Of course, for our purposes today, we’re going to be showing you how to transfer music from iTunes to Device but as you can see on the image below there are other options available as well. 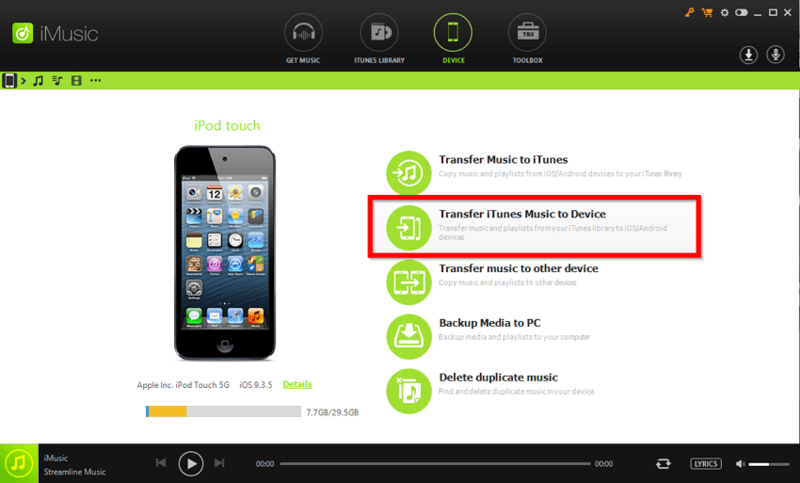 To initiate the iTunes to iPod transfer, click the "Transfer iTunes Music to Device" option! 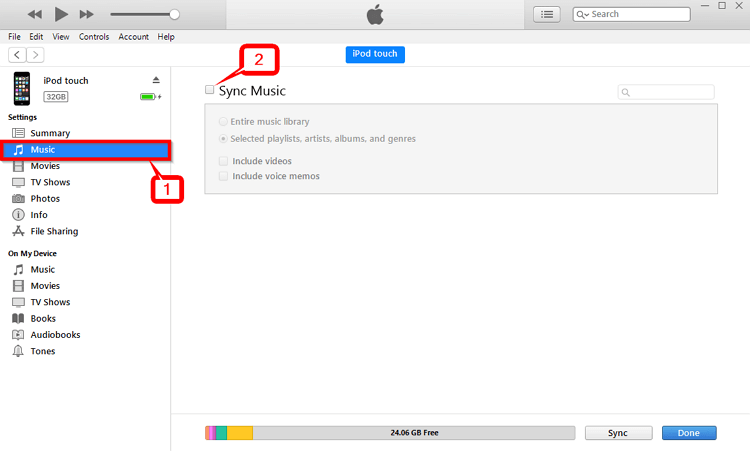 A secondary window called “Transfer from iTunes to Device” should now appear on your screen. From this point on, it’s fairly intuitive. Select what you want to move by toggling it off/on. iMusic really cannot be any easier to use! And what’s more, it’s not limited to just transferring songs onto your iPod. If that’s all you need it for, then that’s all you need to use it for! However, there are a couple of other tips and tricks that you might want to know when it comes to using this transfer software! Continue reading until the end to see just how easy using this program can be. Be it for transferring data, backing up your device, managing your files, etc.! Similar to iTunes, you can also access your iPod song library through iMusic! Just click Device > and then select the Music small music icon! 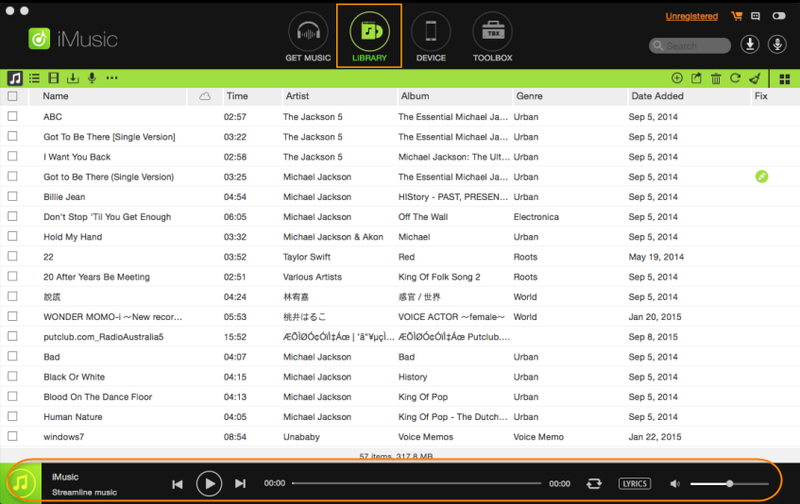 That will move you to a window where you can see all the songs on your device! On this window, you can manually add or remove items using the tools provided on the top right-hand side of the screen. It’s not as easy as simply syncing your music to put on your iPod. However, it is a feature that you can use if need be! Another feature of note is the Playlist window, which you can access by selecting the playlist icon on the top-left hand corner of the device screen. Selecting the playlist window will allow you to view the playlists on your device (be it default playlists or personal playlists.) If you like, you can delete or create a playlist on this window. Which can be useful if you don’t like the tap-and-choose method of manually creating a playlist on your iPod. 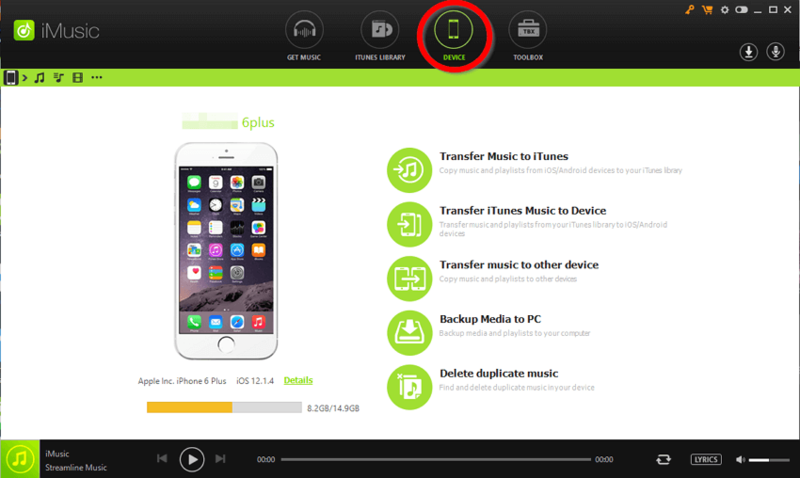 Tip 3 — Transfer music to another device! Now, if the songs that you want to put on your iPod are not on your iTunes library, there is a way of transferring music between devices with iMusic as well! For this, all you’d have to do is select the Transfer music to other device option on the device menu. Of course, you’ll need to have both devices connected to your PC, but that’s really there is to do on your end. iMusic will handle the rest! 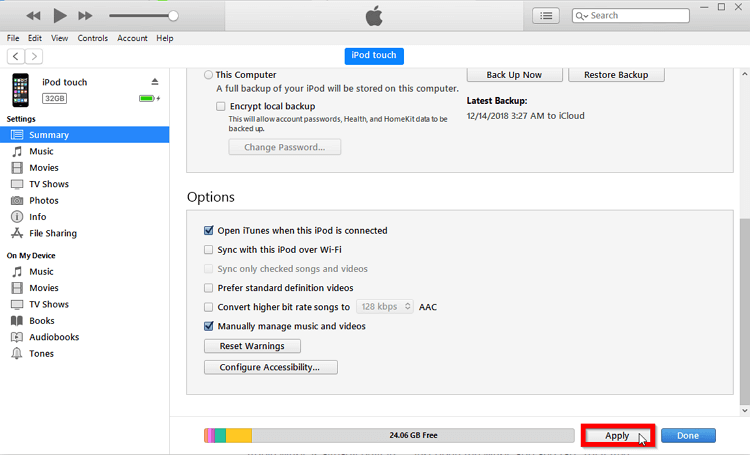 Although some might think it unnecessary, it is important that you constantly back up your iPod. This will allow you to go back to a previous state, which is useful for when you accidentally delete precious files or if your data gets corrupted. 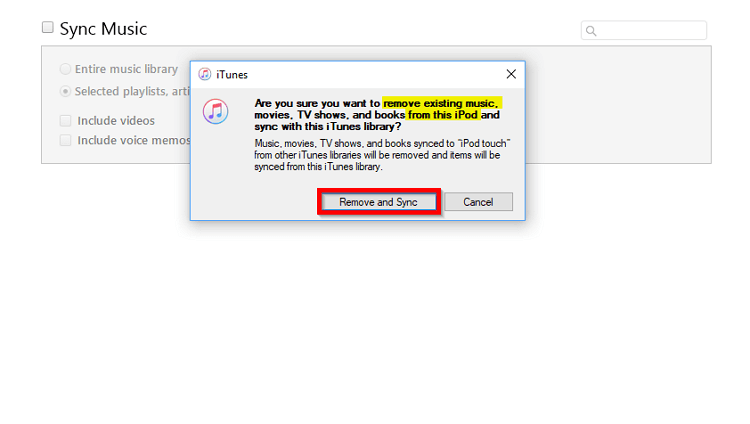 iMusic provides this option so that you’ll be able to restore your iPod to that state, retrieving your loss files and saving your device from corruption. Finally, a concern that some people have when using iMusic is the fact that music is literally transferred. That means, there’s a chance that this might result in duplicated music, which can take up a whole lot of unnecessary space. Fortunately, there is a method of dealing with this issue directly on iMusic! All you need to do is access the Delete Duplicate Music tools on the device tab, and iMusic will do the rest! Conclusion: It is perfectly possible to put songs on iPod with iTunes. 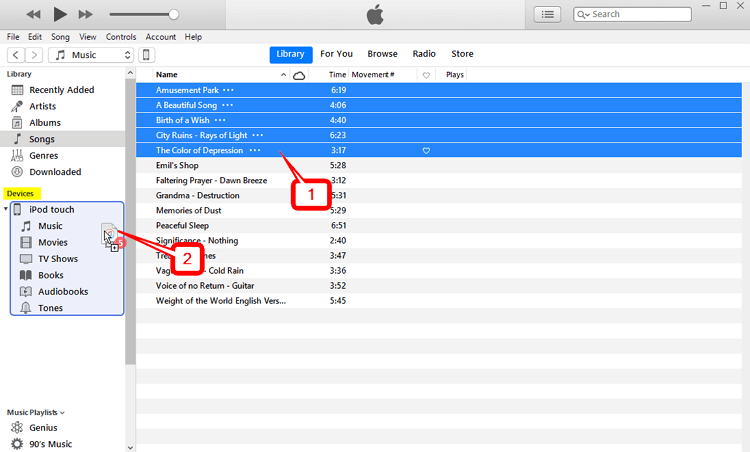 However, it can get pretty irritating if you’re dealing with non-iTunes store purchase music. Apple has enforced limitations on the program on purposes, to make its users more likely to purchase from the iTunes store. 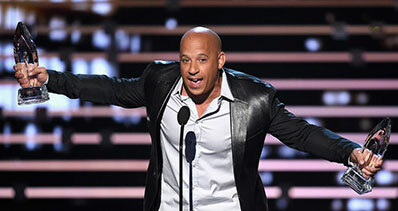 Fortunately, there are ways of bypassing those limits completely, and all it takes is a trustworthy transfer software! For this, we’d recommend the iMusic transfer program. Which, as we demonstrated, is the best and most efficient method of putting songs on your iPod without iTunes!